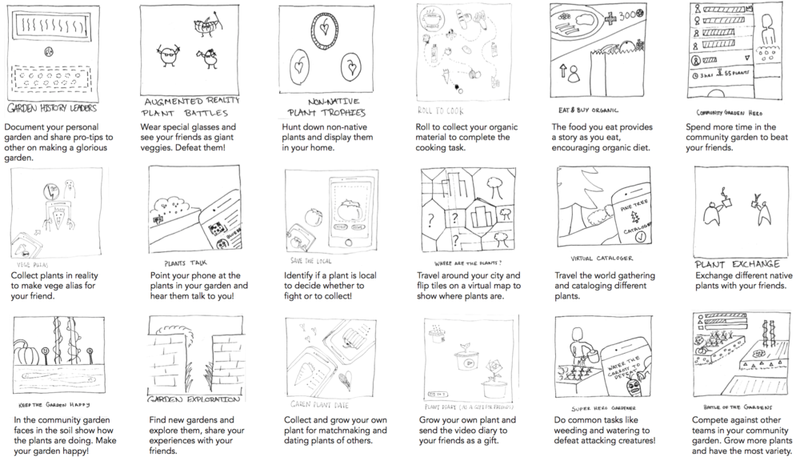 Mystery plant is a behavior change, mobile app game that helps players to adopt and become experts in gardening. Players should nurture the mystery plant in reality with the help of the app, and identify the plant to win. 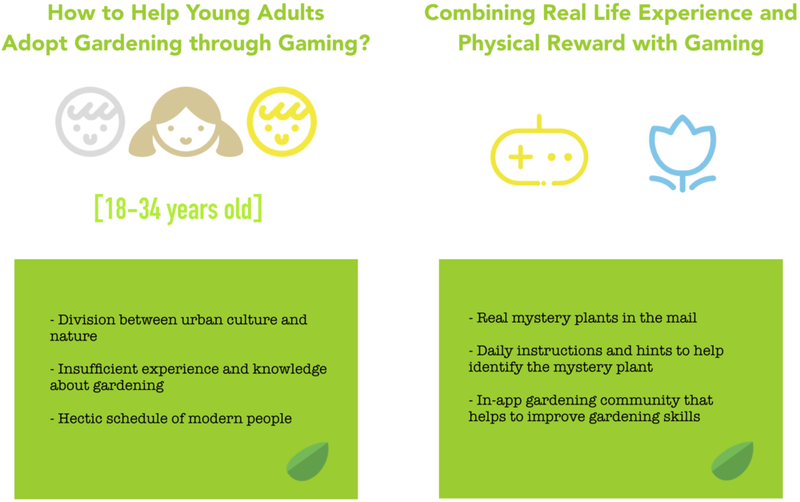 Over the course of 7 weeks, we designed Mystery Plant, a pervasive game app to help young adults adopt gardening and nurture their skills under the supervision of PopCap Games. One thing that distinguishes Mystery Plant from traditional mobile games, is that, at the core, it is about the real world experience of growing a plant. It combines hands-on gardening with virtual game elements, intending to tie our long-lost connection with nature back into the life of young adults. In order to define the problem space within the broader domain of "behavior change", we brainstormed behaviors that can be either adopted, modified or eliminated at outset. Using a 2 by 2 matrix and Interest Spectrum, we were able to narrow down the topic to Pro-environmental behaviors. Interest Spectrum. Sorting the ideas based on their novelty. 2 by 2 Matrix Practice. Measuring their social impact and relativity with daily life. Having employed the Mind Map method, we further identified potential design opportunities in 3 major areas: community gardening, biodiversity, and bicycling. Informed by the investigation into each topic area, we decided on community gardening as the theme to pursue. Combining the Circle of Trust with the Opportunity Map method, we mapped specific gardening behaviors related to aspects of community gardening, measured them based on their potential appeal to the target users and selected the ones close to the center as specific behaviors to ideate on. Along with the exploration, we have dived into game theories and multiple behavior models related to pro-environmental behavior change for 2 weeks, and have summarized the core influential factors in the following diagrams. Interestingly, while the overall population of gardeners grows, the number of young gardeners continued to drop. Thence, we identified our user group as the young cohort aging from 18-34. 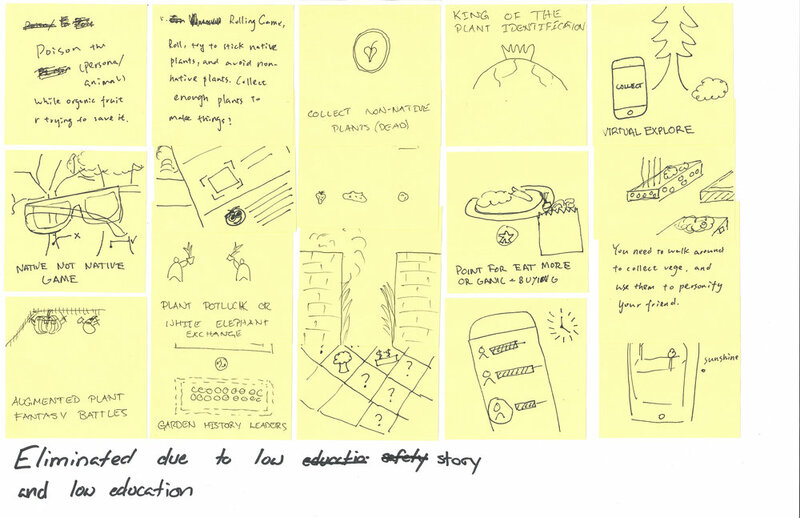 The spontaneous flow of thoughts and inspirations on the topic of pro-environmental behaviors are applied to the canvas as unrestricted drawings. By visually applying action verbs to the behaviors, we were able to approach the topic issue from fresh perspectives. 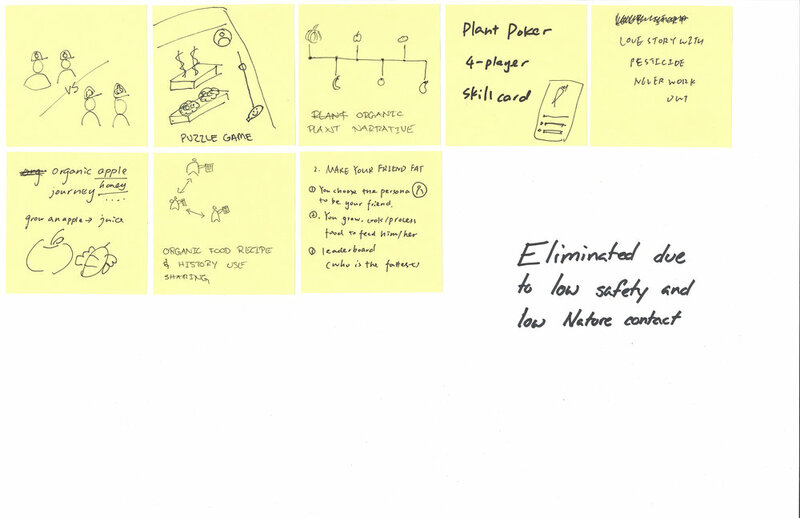 In the timed ideation/drawing session, our group has generated 38 primitive game concepts. By using 2x2 matrices and analyzing how feasible and desirable the ideas were, we found 3 compelling game concepts to investigate further. 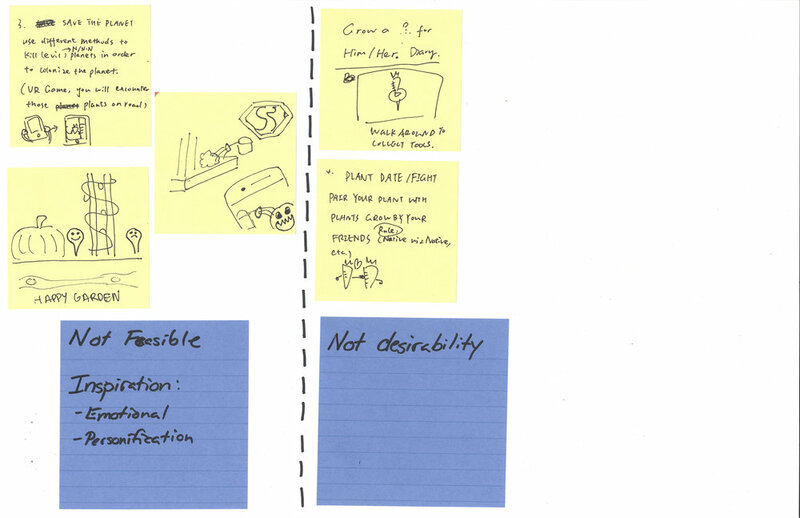 Each concept was scored on a scale of 1-3 in the Weighted Matrix for each category that the team identified as critical barriers that need to be overcome in order to promote pro-environmental behavior change through the concept. This Concept was the Mystery Plant Game. We combined the User Flow, Storyboard and Interface Mock-ups in the Integrated Storyline to better illustrate the initial game concept. This method effectively utilizes storytelling techniques to communicate design ideas. The primitive game concept requires players to identify plants in nature to gain reward to receive new mystery plant in mail. Based on expert critique and peer review, we removed this point colletion loop and highlighted the mystery color in the game by increasing the chance to guess the plant. All "errors" in the game loop we picked apart in the Black Hat Process are listed as questions in the diagram, while fixes are noted below them. People iterate in the game to build their garden and grow gardening skills. The game’s interaction flow is not so much linear as circular. The diamonds are decision nodes, the boxes signifies state while the clouds symbolizes external services that are connected to the app. I took charge of designing the wireframes and interactions. Having selected 5 key features, I crafted the screens involved in the flow with annotations of interactive methods in Sketch. The wireframe design went through 2 rounds of internal and external testing. It was applied to inform high-fidelity UI design. I created the interactive prototye in Principle and scripted it with photos of real life scenarios for external presentation. Intending to deliver a joyful, playful visual message to the audience, I have referenced and employed animation techniques in this demo design. One thing that distinguishes Mystery Plant from traditional mobile games, is that, at its core, it is about the real world experience of growing a plant. If we were to move forward with the project we would gather more insights by reaching out to our target users to see how the design preforms in their lives. I would also want to polish details of the UI design, i.e. to lighten the shade of shadow. Mystery Plant, is a chance for everyone to grow.